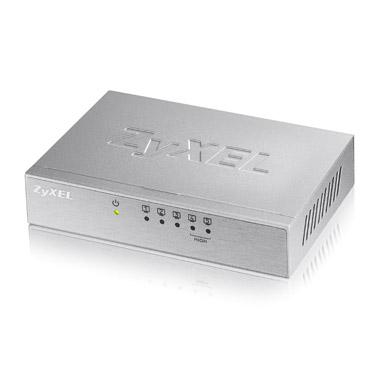 The ZyXEL ES-105A v3, a five port desktop switch with plug-and-play design, can easily connect devices including PCs, network storage devices and print servers to your home network. The ES-105A v3 offers advanced High Priority ports to boost performance and user experience for Internet surfing, online gaming, multimedia or any application you prefer with prioritized bandwidth. Compliant with the IEEE 802.3az Energy Efficient Ethernet standard, the ES-105A v3 provides power-saving benefits without compromising performance. The ZyXEL ES-105A v3 fits any working environment. The stylish, compact metal housing with wall-mount installation design provides more flexibility for wired home networks. The affordable, reliable series comes with five ports to meet home network expansion needs. The ZyXEL ES-105A v3 v3 comes with two high priority ports. With the port-based QoS feature, the ES-105A v3 provides considerably enhanced download quality. Users can experience better performance for Internet surfing, online gaming and multimedia streaming through prioritized bandwidth settings. The ES-105A v3 features increased buffer memory to maintain smooth network transmission while the switch is handling heavy loads. To protect the network from broadcast storms, the ES-105A v3 can immediately locate a port experiencing loop errors and then blink the appropriate LED light.